This morning we read in the media that Quebec is going to impose a "ticket modérateur" on medical visits beginning in 2012, that this is not a trial balloon, and that discussions are under way with the Federal government about how the Canada Health Act will treat this. Finance Minister Raymond Bachand, who announced the plan in his budget yesterday, says this is all part of a great plan to put the province's financial house in order, of making the user pay. This is nonsense, particularly since a number of studies have shown that user fees don't save any money. They also contravene the Canada Health Act which supposedly guarantees universally accessible medical care in Canada, which in turn means that there should be no economic barriers to getting care. For some time, I've been agitating among the groups I belong to for campaigns to actually enforce the Canada Health Act. But there has been sorrowfully little action, even among my friends at the NDP who should be in the front rows of such a campaign. Pity. Let us hope that there is vociferous protest to this part of Bachand's right wing budget. Let us not forget either that major reasons why Canada has come out of the global financial meltdown so well are outgrowths of policies light years away from the philosophy of Bachand, Charest, Harper and company--a good social safety net that kept purchasing power up, public investment in infrastructure projects begun before the trouble began, and better regulation of financial institutions. Thanks to UBC health economist Robert Evans for his comparison of health care user fees with zombies, BTW. 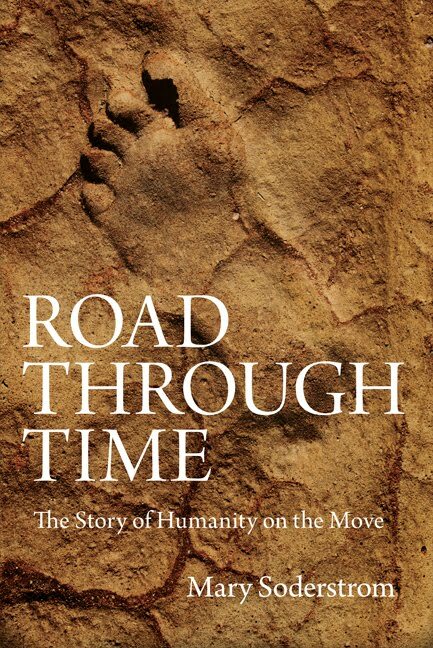 Yann Martel is still waiting for Stephen Harper to get involved in the little "book club" that Martel began nearly three years ago--you'll remember that he's been sending a short book every two weeks to the PM since he noticed that Harper appeared to lack "stillness" in his life. But at least one North American head of government thinks that Martel is great: Barack Obama sent a little hand written note a couple of weeks ago, thanking Martel for writing The Life of Pi which the American President and his daughter had enjoyed reading. What a class act! As Martel notes, Obama isn't going to get any political mileage out the gesture, but it means the world to a writer. Martel himself is taking four months off from the book club, as it turns out. He's going to be travelling to promote his new novel shortly so he's asking some writer- friends to help out. Stephen Galloway kicked it off by sending King Leary by Paul Quarrington, while Charles Foran has just sent Ray Smith's Century. I can understand Martel wanting to step back from the project that has taken on a life of its own, and I have great respect for Galloway, Foran, Quarrington and Smith. But I do hope there will be some women included in the pinch hitters. Now back to work on my own manuscript. It's always nice to wake up happy, although at 4 a.m. Sunday morning I couldn't figure out what was going on. It was only as I lay in bed, not able to sleep but not fretting about anything, that I realized what the problem was: chocolate mousse. The gang was over for Sophie's birthday on Saturday night, and dessert was chocolate mousse which we finished eating about 11 p.m. The chocolate high didn't kick in right away, but by the early hours of the morning it certainly had. I was reminded of Lukas's first experience with chocolate cake at a year and a half: he woke up about 1:30 a.m. and sang to himself in his bed for half an hour. I didn't sing, exactly, but about 5 a.m. I cheerfully went down stairs to do the dishes. The cheerful, sleepless mood continued until the middle of the afternoon when suddenly I collapsed. No matter: it was a lovely dinner. Here's the recipe, in case you're interested. Make a crème anglaise by melting with 4 tablespoons of butter in a saucepan, and wisking in 2 tablespoons of flour. Add 1 cup of rich milk or cream, and stir until smooth and thick, about three or four minutes. Add 1/3 cup sugar. Then grind two cups of chocolate chips in a blender. Put in top of double boiler over hot water and add 1/3 cup of hot water, and 4 tablespoons of butter. Cook until melted, then beat in five egg yolks, stirring until thick and smooth. Quickly stir crème anglaise into chocolate mixture. Then fold carefully into egg whites. Pour into small cups or wine glasses. Makes 6 to 8, depending on size of cup or glass. As I enter the last week of work on Making Waves: The Portuguese Adventure I'm back reviewing photos I've taken over the last ten years to refresh my memories. 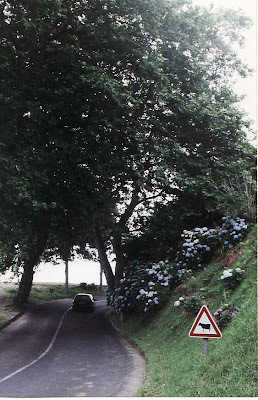 This was taken on the highway that runs east along the south shore of São Miguel in the Azores. 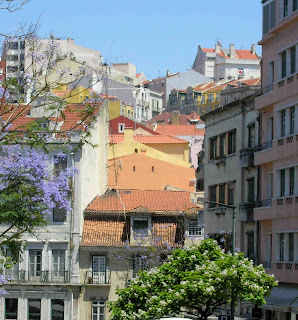 The island is a big producer of dairy products--when I was in Lisbon last spring, the supermarkets were full of Ultra High Temperature treated milk from São Miguel--and cows are everywhere. A little farther down this road I had to brake suddenly when I came around a curve to see a herd of cows clopping along the road. It so unnerved me that I didn't even think to take a picture. The flowering bushes on the hillside to the right are hydrangeas--hortensias in Portuguese--that were planted as hedges to divide fields decades ago and now have naturalized. Very lovely. Note: I've promised Making Waves to Véhicule Press by Tuesday, April 5, but there certainly will be more work, so I'm bound to have more posts about it before the publication date which will be sometime next fall. The Jesuit Relations and Robot Reporting: An Argument for Printing Those Documents Out! Interesting juxtaposition in Le Devoir today: a story about the increasing use of non-human tools to gather news, and one about the new Jesuit archives in Montreal. The first begins by detailing Stats Monkey, a program developed at the Intelligent Information Laboratory at Northwestern University. It purports to be able to write an account of a baseball game, for example, using on-line information about box score and play by play that "captures the overall dynamic of the game and highlights the key plays and key players." The second story is a visit to the center for Jesuit documentation, opened last fall. It includes "more than 300 items from New France in the 1600s, 18,000 books, 1,500 rare books" plus memoirs and official records. Jesuit missionaries were supposed to write annual letters back to their headquarters, and these Relations are some of the most detailed windows of the world where European explorers and conquerors were followed by priests. That they exist today in printed and manuscript form shows the importance of recording current life in something more permanent than electronic media. Of course, notes the first story, using robot reporters to produce ordinary news stories could free flesh and blood journalists to do more in depth reporting. And it's true that some good stories have recently come to light by reporters who were given the time to do some digging, including some bombshells about questionable connections between the construction industry and the Quebec government. But is anybody printing out these stories and making sure they're archived? It's not even clear whether newspapers are keeping hardcopies, and certainly radio and television aren't. 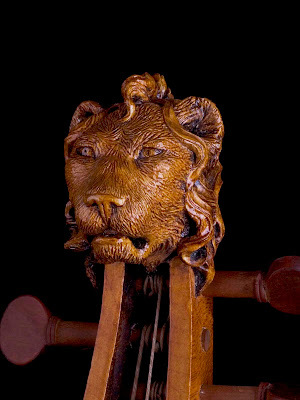 If we don't there will be no documents like those in the Jesuit archives which will bear witness too our times. St. Patrick's Day is past, but Elin has just drawn my attention to a concert now on Espace Classique, Radio Canada's internet presence "La Nef célèbres le St. Patrick." It features the music of 17th century Irish composer and luthier John Dowland played by the Montreal group La Nef with Irish counter tenor Michael Slattery. Elin is also in the band, which recorded the concert last fall. Definitely worth listening too. But beware! when you click on the link, you'll get whatever happens to be playing on Espace Classique. To get to the concert, scroll down to "Ecoutez le concert" and click again. A couple of days ago a survey which showed that a sizeable percentage of Montreal municipal employees live outside the city, got me thinking about the problems people of modest means run into when buying a house here. Obviously, I'm not the only one concerned because the city's has just announced increased subsidies to couples and families buying their first house in the city. The subsidies aren't a new thing--previously families with at least on child got a subsidy of $10,000 for first-time house buyers on houses including condos worth less than $265,000. Now, though, the subsidy goes up to $12,500 and the maximum to $295,00. Childless households are eligible for a one-time grant of $4,500 to buy homes worth a maximum of $235,000. In addition, a bunch of measures designed to make the city more attractive to young families were announced. Among them is reserved parking places near parks and recreation facilities for families, and six months of free bus and Metro service for one person in the family who buys the basic Opus card. "If you really calculate the investment that you have to make if you go to the suburbs, you gotta realize that you need a second or even a third car," Mayor Gérald Tremblay said at a news conference on Sunday. "If you calculate that, it means you could invest $80,000 more in the purchase of a property in Montreal." In February the median price of a single family home in the Montreal area was about $245,000, with higher prices in the center of the city. Of course, there's a certain irony in calling these sort of prices, "housing for people of modest means." But unfortunately that's the way it is. A family or a couple need to have two salaries or one really good one to pay for decent housing. A good day care program is also needed if you want to put good housing within the reach of the young. It always nice when someone likes your work enough to ask you some intellligent questions. That happened recently when Susan Olding, a Kingston-based writer and reviewer, sent me a set of very interesting questions by e-mail. 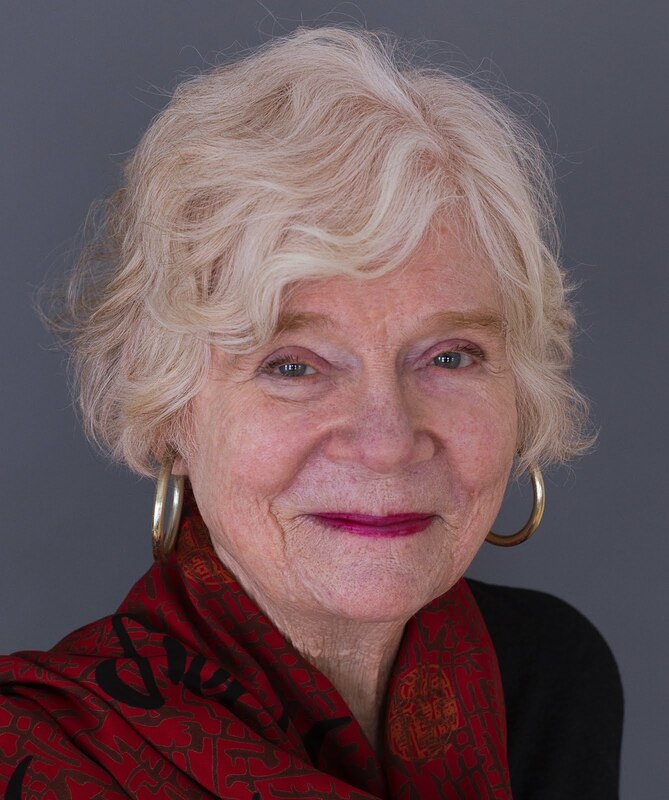 She said she did it because she had liked my Walkable City: "An original idea, gracefully executed, The Walkable City compels us to think harder about our own neighbourhoods and what we expect and hope from them." Work is progressing on Making Waves, and mentally at least I'm back on Lisbon today. Hence this picture I took last year on my visit on a lovely May afternoon. More than 80 per cent of Montreal's police and firefighters don't live in the city according to figures released yesterday by Richard Bergéron, head of the opposition municipal party Projet Montréal. The figure drops among other employees but more than 40 per cent of all city employees live elsewhere. The most striking example comes from the bedroom community of Repentigny, north east of the city: 292 Montreal police officers live there, while that municipality itself has a police force of only 105 officers. Bergéron's party got the figures through an access to information request. He's quick to say that he doesn't want to criticize the employees themselves, but he does want to question why the city gives free parking and car allowances to some employees. Providing free bus passes would be a better measure, as well as cheaper, he said. City officials as well as spokepersons for the unions of workers involved questioned Bergéron's estimates of how much money would be saved, although none challenged the figures on out-of-city-residence. But no one tackled two thorny questions which are linked to the choices people make when deciding where to live. Houses are cheaper to buy (although not necessarily cheaper to live in) in the suburbs, and many city workers simply can't qualify for financing to buy a house or a condo in the city. Part of the solution to this problem is related to making affordable housing available in the city, and making sure that the people who work for the city earn decent money. I've just spent a half hour of time I don't have trying to upload a picture that Elin has on her Facebook profile: check it out. The occasion is the announcment that she and Emmanuel are expecting a little one in mid-August. We've known since Christmas Eve, actually, but there is no way to go more public than on Facebook. Needless to say this will mean some changes in the lives of many people, not least of them Lee. He currently is the basement planing boards for a chest of drawers/changing table he's started for the Crevette/Shrimp, as they're calling it at the moment. I had hoped to get him to come to Portugal with me in May or June but he says he can't because he's got to finish the project by late July at the very latest. 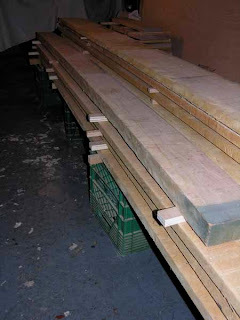 Photo: The wood for the project drying in the basement. Flocks of geese flying over this morning on their way north to nesting grounds. Life goes on. Work calls. More tomorrow. Today I'm working on the chapter of Making Waves which will deal with samba and fado as elements of the Brazilian and Portuguese soul. This means that I haven't much time for thinking about other things than music and this project. So today's post concentrates on them. To the left is a picture of the Lisbon and Coimbra guitarra portuguesa, with their steel strings and their haunting sound. Below is a video of one of the masters play Canção do Mar. Once upon a time this stream ran down the north side of Mount Royal to pool in Outremont, forming bogs which have since been transformed into Outremont and Saint Viateur parks. Now it runs through concrete pipe for some of its route, but in places it still sees the light of day. The photo was taken in Mount Royal cemetery where it is allowed to meander a bit. This morning, despite temperatures below freezing, there was no ice on it as it burbled away. 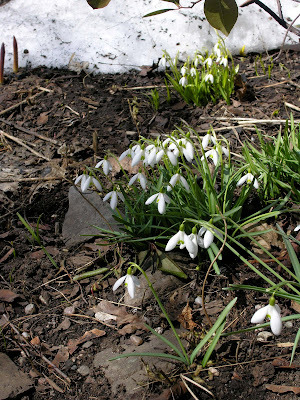 More signs of spring. Next week, we'll be discussing Gwethalyn Graham's Earth and High Heaven at the Atwater Library, and I've been scouting around to see if I can update the information I have about the book. In doing so, I came across a great story from 1944, the year it was published, when Time reported on the amazing success publishing was having. The story begins: "Asked how he was handling the...buying rush, the manager of Scribner's Manhattan bookshop replied...: "Oh, at 9 o'clock we just open the doors and jump out of the way." It continues: "Almost every published book was sold, and many a title would have sold far more copies if paper had been available to print them. Despite competition of movies, magazines and radio, more U.S. citizens were reading more books than ever before." Probably most of the 1944 titles have been forgotten, but among the books that flew off the shelves were some very good ones including John Hersey's Bell for Adano, Lillian Smith's story of miscegenation in the South, Strange Fruit (475,000 copies), and "Graham's homely rebuff to Canadian antiSemitism, Earth and High Heaven (125,000 copies)." Part of the boom, the story muses, is due to gasoline rationing which kept civilians at home and the lack of entertainment and masses of deadtime soldiers faced. I remember my father, WWII vet from the US Army, grumbling about how often he had to "hurry up and wait," while my brother-in-law's father, a British Marine enlisted man who served in Northern Africa and Burma, spoke fondly decades later of paperbacks that fit perfectly in the pocket of fatigues and could be pulled out whenever he had a few minutes free. It would be interesting to know if paperbacks--or even Kindles--are readily available to the tens of thousands of troops in Iraq and Afghanistan. As Time notes "reading habits acquired by millions...are unlikely to be broken. And the public appetite is certain to be fed and stimulated by mass production and distribution of books on an unprecedented scale. " It's nice to know that the Bouchard boys, Alexandre and Simon, won't have to worry about paying tuition wherever they're in school (I've tried to track them down, but can't, and that's probably all to the good.) 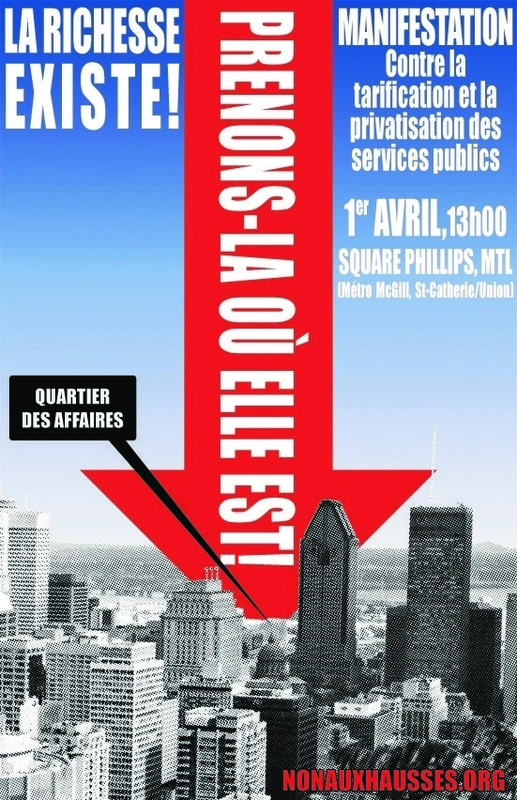 Montreal newspapers report that their father, former Quebec premier Lucien, who called out for massive tuition hikes for Quebec universities a little while ago, has brought in more than $5 million in business for the law firm he's working for, Davies, Ward, Phillips & Vineberg. First, the electronic newspaper put out by locked-out Journal de Montréal writers, Rue Frontenac, noted that the Université of Québec à Montréal has paid the firm, with Bouchard as the point man, $2.7 million, as it tried to extricate itself from a deal with a developer involved in the excessively expensive new complex in downtown Montreal. Then today Le Devoir says that Montreal's transit authority has budgeted $2.5 million to the firm for the services of Bouchard and his team in the messy acquisition of Métro cars. I have no idea how many hours Bouchard billed for the work, but he is very likely walking away with more than loose change. Certainly his boys won't have the same problems paying for their studies that a whole lot of others have. Saving Biodiversity Through Credits to Offset Damage: Good Ideas or Good-looking Scams? Can't decide if this is good news or bad news. The Ecosystem Marketplace reports that there are 39 projects world wide which are trying to protect biodiversity by "making it possible for real estate developers to offset their damage to nature by paying for the creation or preservation of habitat." Among them are six active projects in Canada, mostly involving habitat banks. Another 25 projects, including one in Canada, are in development. At first glance, these sound like initiatives that bear encouragement if development is going to allowed in the first place. Certainly the idea of "carbon credit" kind of support safeguarding ecosystems has precedent in such things as cleaning up acid rain. But there's a caveat: the report notes that 80 per cent of the projects are not "transparent" enough for the research team to tell how big the positive impact might be. And experience shows that it's wise to beware when there's a lack of transparency. In December Philip Gourevitch reported for The New Yorker on one man's effort along these lines. The story "The Monkey and the Fish" tells about how philanthropist Greg Carr is trying to save Gorongosa National Park in Mozambique. Carr has hundreds of thousands of dollars to spend in his efforts, but Gourevitch shows just how tough the job is. Righteous Anger, Psychiatry and Movement for Change: Not Prozac but Progressive Action? Louis Menand has an interesting discussion about psychiatry in the March 1, 2010 New Yorker. At issue is the changing definitions of various mental problems and the lack of clear answers about how to treat them. He begins with an all-too-common case: you lose your job and you're depressed. At what point does your sadness, inaction, repressed or vented rage and general unhappiness pass beyond what is normal to what should be treated chemically or therapy or both? Do any of the treatments proposed actually work? If they do, should they be used since some things--like anger over an economic and political system that allow people's lives to be ruined--might be best handled by a whole lot of people, righteously angry and bent on demanding constructive change? Menand has no ready answers, but the questions are important ones. The only thing that I think is clear is that anger over real problems, like unemployment, should not be channeled into blind reaction, as seems to be the case with the Tea Party Movment and their ilk. Where's the Left in all this? Not shouting loudly enough for sure. Cartoon from The New Yorker cartoon bank. Would You Stand in Line to Vote When Polling Stations Were Being Bombed? Who believes in democracy? Not some Americans, it seems, if the current wave of right wing wacko rhetoric is any indication (see the various scary articles about the Tea Party etc..) But amazingly somewhere around 60 per cent of Iraqi voters cared enough on Sunday to cast their votes in legislative elections, despite considerable violence aimed at voters. Forty people were killed by bombs and other attacks, but people stood in line and braved the danger nevertheless. The turnout apparently was down from elections in 2005, but that it was as high as it was is heartening. One reason may be a certain hardness of attitude that comes from living with war for so long: when your number's up, your number's up, in other words. And also the fact that Sunni leaders urged their followers to vote helped turn out voters. They want to shore up their side as Iran and Iraq jockey for power in the region. Whatever the reason, I admire the courage and commitment of Iraqi voters. Would that people here thought that casting ballots was so important. The string of lovely late winter days continue, so this morning I went out to take some pictures. The snow family below were made during the last snow about 10 days ago: Dad, Mom and a child who were resplendent with scarves, parsnip noses, and eyes made from rounds of carrots. 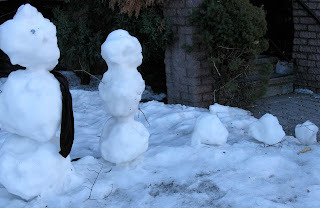 As the melting advanced the vegetables disappeared--the squirrels are out!--and yesterday I noticed that the snowchild had disintegrated or been reduced to three snow kittens/balls/babies. 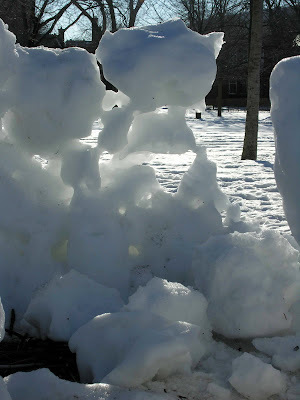 Further along in the park, the snow blocks that made up a snow fort have thinned out to be more window than wall. Very lovely as the rising sun slanted through them. Spring is here! Yesterday Sophie and her Dad went down to St-Pie, the small town the Bousquets are from, to help out with the sugaring off. The sap has been running for a good ten days now, and syrup production was in full swing. 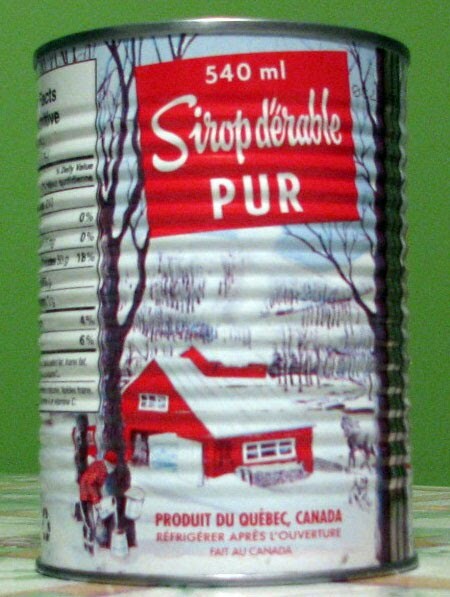 The sugar bush belongs to one of her uncles, now in his 70s. He was in charge, but he was assisted by relations of all ages. Among them was a grandson, now 16, who has been dreaming of becoming a dairy farmer since he was 6, and who now is trying to learn all he can about maple syrup so he can carry on the tradition. 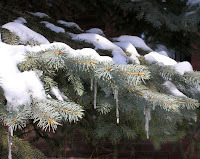 Sugaring off requires days with temperatures above freezing but nights when it freezes well. The forecast for the next few days calls for just that kind of weather so perhaps it will be a good year. Tant mieux, particularly because a couple of years ago Sophie's uncle only had one day of good flow since the temperatures jumped from really frigid to balmy almost overnight. Ah farming! You've got to be a gambler to get involved, and all the rest of us are endebted to you too. Last year was a disaster economically for a lot of people, among them those who run recycling services and companies. The bottom dropped out of the market for recycled waste in the Autumn 2008, with the price falling from $115 to $35 a ton. Prices remained low all last year, but, Louis-Gilles Francoeur reported in Wednesday's Le Devoir, things are looking up. According to Ginette Bureau of Recyc-Québec , the price is now up to $85 a ton, which is enough to make the difference between survival or failure. During the several long months when recyclable waste piled up, none was thrown away by the recycling companies, and none of them went broke. The Quebec government helped out with finding places to store the collected waste, and some companies were able re-negociate contracts with municipalities in order to cut costs. Now the province is providing funds to upgrade sorting facilities, with the hope that better sorting will produce more valuable waste and better prices. That's all to the good, but I'm wondering if there has been an actual decline in the amount of post-consumer waste in recent months. If people buy less, they have fewer cardboard boxes etc. And certainly there has been a sea change around here when it comes to plastic shopping bags. The provincial agency which sells beer, wine and spirits hasn't had them for more than a year, and several of the supermarket chains are charging 5 cents a bag. Reminds me: I must do a really big grocery shopping today, so I'll have to dig out all my canvas bags. Last time I didn't have enough. 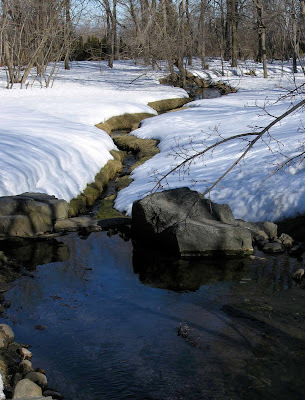 The sun is out today and the snow is melting in our version of "The Waters of March." 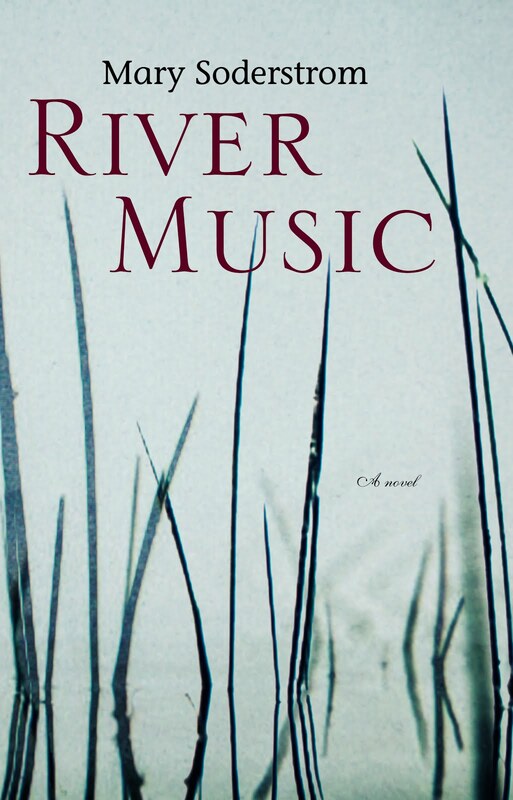 The first time I heard the excellent song by Tom Jobim, the rushing streams of spring were what I thought of, but now I realize that the waters referred to are really the fall rains after the Brazilian summer. Peut importe, as they say around here. It's a great song and very appropriate. This version by Ellis Regina and Jobim is a classic with English subtitles: sorry that it skips a little. Hard at work on Making Waves: The Portuguese Adventure which I'm supposed to get Simon Dardick at Véhicule Press by the end of the month. Not much time, therefore, for a post. But here's an interview with the producer of Garapa, a film about poverty in Brazil I saw last fall at Montreal's World Film Festival. A gripping documentary, that seems more and more important the further I travel into writing about Brazil. Today is the last day for companies and consortiums to submit "letters of interest" in building Métro cars for Montreal. It seems likely that the Spanish group CAF will answer the call, as will, evidently the Bombardier-Alstom consortium that a whole lot of people had the job in the bag a couple of years ago. The Chinese company Zhuzhou Electric Locomotive may do so also, even if they want to construct cars with steel wheels instead of the pneumatic ones which have been Montreal's pride for four decades. All this activity will probably put back the acquisition of more than 400 new cars, rolling stock which is badly needed both to replace aging cars and to respond to increased Métro use. That's bad news. But what's even worse news is what set the scene for this delay. The Quebec government, which will pick up some 75 per cent of the tab, and Bombardier, the Quebec industrial giant with a special expertise in rail construction, negotiated a deal in 2006 without a public call for bids. But Alstom successfully challenged in court the way the contract was awarded. This meant that negotiations were re-opened with the result that Alstom got a cut of the deal. Now other international companies see no reason why they can't bid too--and are ready to challenge exclusion in the courts. Moral: don't try to short cut established bidding procedures. Memo to Premier Jean Charest: is this another example of fall out from playing footsie with your friends?